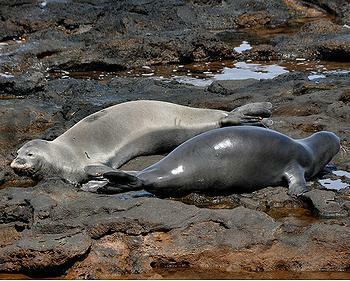 HONOLULU, Hawaii, June 7, 2011 (ENS) – A potent toxic chemical that affects the nervous system has been identified in the bodies of Critically Endangered Hawaiian monk seals. Researchers from the National Oceanic and Atmospheric Administration, NOAA, have found that Hawaiian monk seals are exposed to ciguatoxin, a toxin produced by marine algae common on coral reefs. “This work provides first confirmation that Hawaiian monk seals are exposed to significant levels of ciguatoxins and first evidence of transfer of ciguatoxin to marine mammals,” the researchers write in their report. Ciguatoxins are potent neurotoxins that concentrate in fish preyed upon by the critically endangered Hawaiian monk seal, Monachus schauinslandi. “Based upon this study, we believe that ciguatoxin exposure is common in the monk seal population,” said Charles Littnan, study co-author and scientist with NOAA Pacific Islands Fisheries Science Center. The scientists suspect ciguatoxin exposure might be linked to the ongoing decline of these seals, whose numbers are estimated at between 1,100 and 1,200. “This study is an important first step. However, we still need to understand more clearly how widespread exposure is and more importantly what role it may be playing in the decline of the species,” said Littnan. Monk seals were sampled throughout the Hawaiian Islands, including in the Papahanaumokuakea Marine National Monument. The samples were then shipped to NOAA’s National Centers for Coastal Ocean Science laboratory in Charleston, South Carolina for toxin analyses. Tissue analysis from dead stranded animals revealed ciguatoxin activity in brain, liver, and muscle, while analysis of blood samples from 55 free-ranging animals revealed detectable levels of ciguatoxin activity in 19 percent of the animals. The chemical threat could pose “management challenges” for this endangered marine mammal species, which has been dwindling at four percent annually due to poor foraging success and other environmental and human factors, the researchers write in their report. The only previous report for Hawaiian monk seal ciguatoxin exposure occurred during a 1978 mortality event when two seal liver extracts tested positive by mouse bioassay. The Hawaiian monk seal is considered to be a special treasure in the Hawaiian islands. Native to the islands, they are one of the most endangered animal species in the world. The research results are prompting ciguatoxin investigations of other marine mammals in the state. Ciguatera, the human disease caused by ciguatoxin, affects thousands of people worldwide every year. Symptoms include acute gastrointestinal and neurological illness and chronic fatigue.